We live in Eastern Ontario, which doesn't have a great wind resource. Actually, it doesn't have a very good solar resource either. 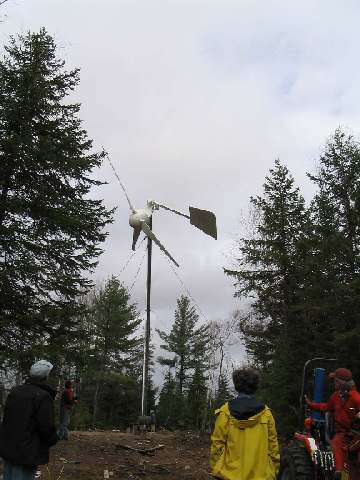 Nevertheless, we wanted to round out our generating capacity with a wind turbine. 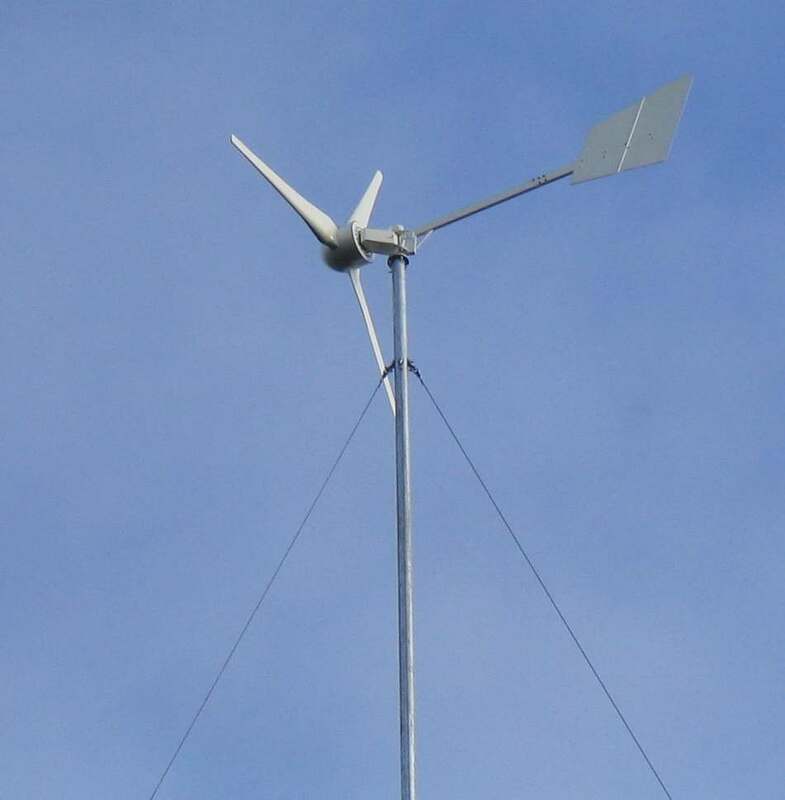 After looking a long time for a suitable unit we bought an African Wind Power 3.6, so called because its blade span is 3.6 metres, or just under twelve feet. It has a 48 VDC three phase alternator rated at 1 kW. We put it up at the end of October 2004. The solar and power management installation. 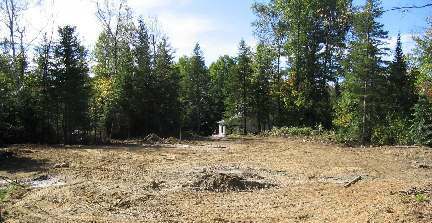 This is the site for the tower looking south towards the house and shop. 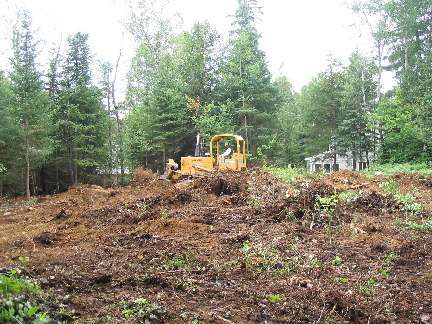 You can just see the shop through the trees in front of the dozer. When we started the site was rough, not even close to flat and Dave the dozer and backhoe guy dug up rocks the size of pianos. Somehow, he managed to get the site flat and level. 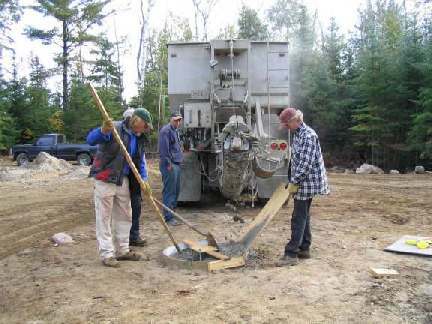 Pouring concrete for the footings. This is the central tower footing. 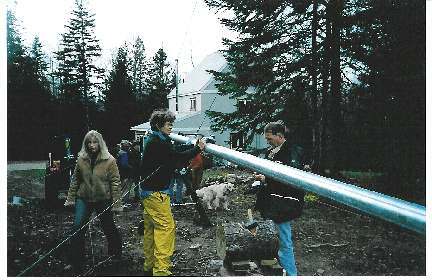 We used three foot diameter tubes like this one for the central, east and south footings, and fabricated three foot square footings for the more heavily loaded north and west footings. The footings are all at least five feet deep. Probably overkill, but we didn't want to take chances. After all, how many of us have experience with footings that must resist lifting and pulling sideways? Eight yards of concrete went into the five holes. That is Lee on the left poking the concrete. 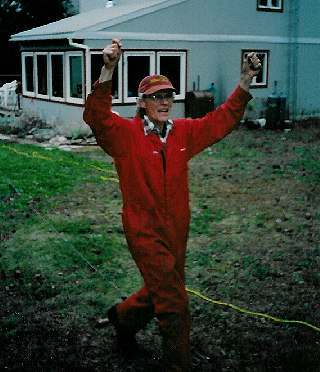 He helped me prepare the site and set up the footings. A shot from the same location as the one two pics above, but a month later, showing the level site with the footings and anchors in place. If this photo were blown up, you could see all five footings, four for the guy anchors and one central tower footing. The guy anchor footings are 43 feet from the tower base footing. At right is the tower all rigged and ready to raise. 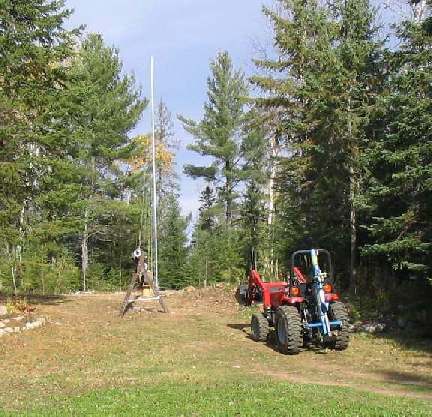 What looks like a tower at the centre of the site is actually the gin pole, which is "only" 42 feet tall. You can see the five cables running from the top of the gin pole to the joints in the sections of tower pipe. There are five sections of pipe in the tower for a total height of 105 feet. 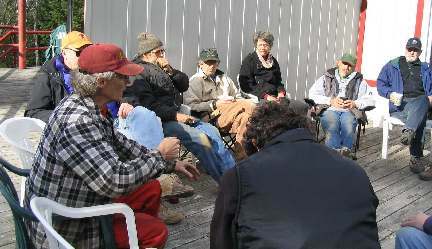 Above: Lunch break and pre-lift meeting. No one involved had any real experience with serious towers like this, so it was a major learning process for everyone. Almost the same cast of characters reassembled for the final lift of the turbine a week later. This is the test lift of the tower without the turbine mounted. 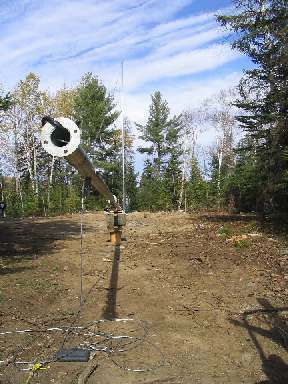 The hoist cable runs through a block and tackle rigged between the top of the gin pole and the hoist (north) anchor which is 43 feet beyond the tower base. The hoist cable then runs all the way back past the tower base and the still horizontal tower to the tractor, the shadow of which you can see at the bottom right. 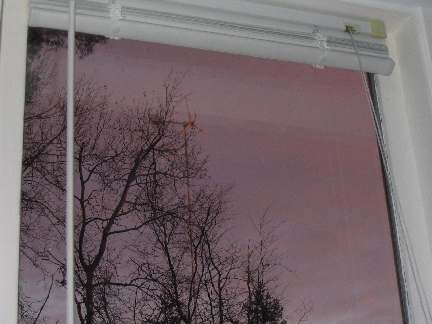 The skinny 3/16" hoist cable is barely visible on the ground. I used the tractor to lift the alternator and mount it to what the manufacturer calls the "yaw head". It doesn't look like much, but that alternator is REALLY heavy for such a small device. I didn't weigh it but it must be over a hundred pounds, considering that the total tower top weight of the turbine is 250 pounds and the alternator is the heaviest part. The housing is machined cast iron and inside are a lot of permanent magnets and heavy copper windings. The turbine is an odd example of an elegant design carried out with 1950s technology, with simple fabrication and funky welds. Nothing lightweight about this unit. This is the day of the big lift. 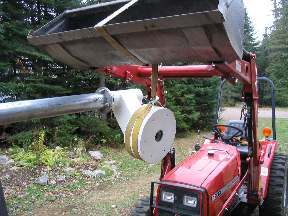 There was much debate as we mounted the turbine blades and aligned them according to the manufacturer's instructions. That is Lee facing the camera and my brother Richard consulting with me. Neighbor Mike is at the left and Mitch from Embers in Perth on the right. We bought the turbine and tower through Embers. While the other final preparations were being made, Lydia and Frank spent a couple of hours carefully cutting off the loose ends and tying off the cables. In all they trimmed 44 cable ends. That is Vanessa from Embers in Perth walking by. 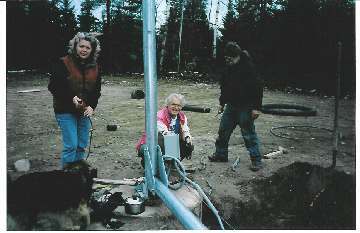 Below is Wendy, Brian and Mo making final electrical preparations at the tower base before the lift. Brian has done all the electrical installation because the owner of the system (me) is essentially clueless when it comes to electrical. Morley the dog was also willing to help. At right is the lift of the tower with the turbine mounted. It went up without a hitch, although it certainly was dramatic. Lydia, in yellow, walked beside the tractor for the 150 foot travel it took to lift the turbine. She was relaying signals to me from Lee who directed the lift from the tower base. 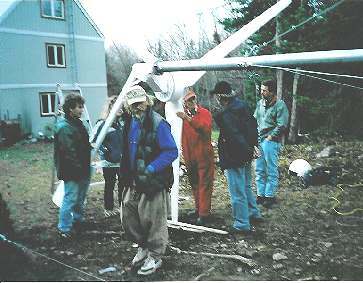 At right, a few minutes after the lift as the whole crew does final securing of the gin pole and checking cable tension all around. When we flipped the switch and the turbine started and the meter showed 15 amps, then 20 amps flowing into the battery bank, I was just thrilled, as was everyone who took part. A colleague called this the modern equivalent of a barn raising. How true. Not in its native habitat. 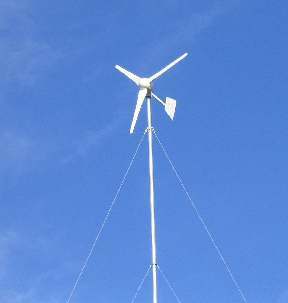 The AWP turbine was designed by a Scot and built in South Africa. The question of its ability to tolerate the Canadian winter has come up. So far it has experienced a winter of very cold temperatures, several dumps of heavy wet snow and at least two bouts of freezing rain with no apparent ill effects. The turbine puts on quite a show in high winds. The tail boom is hinged to the power head so it can swing almost 90 degrees independently. And it swings a lot in strong winds, but the power head itself stays remarkably steady, even when furling away from the wind. In this view you can see the offset mounting of the alternator relative to the tower centre line. This design creates forces that turn the power head away from the wind when it gets too strong. It begins this furling motion in winds over 25 mph. 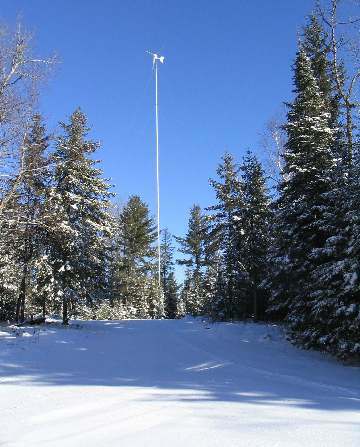 This turbine is promoted as starting up in wind speeds as low as 7 mph and making good power in low to moderate winds, which is mostly what we have here. So far, it seems to live up to its billing, producing around 5 amps (@48VDC) in a light breeze and peaking at about 22 amps in higher winds. This is a view of the turbine from my third floor office window at sunrise. I just need to turn my chair slightly to see it, and I can assure you that I take a look many times a day. Solar panels are nice enough and are almost maintenance-free, but are they ever boring to watch.